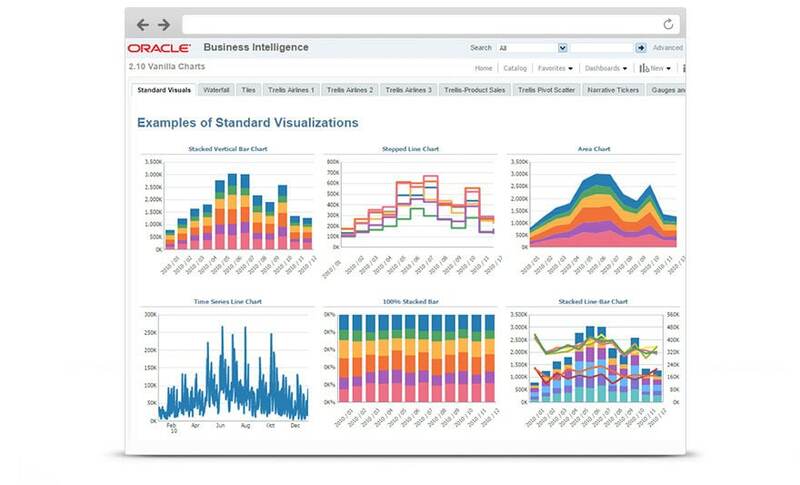 Oracle Business Intelligence offers a combination of agile visual analytics and the power of an enterprise platform. Data visualization offers a streamlined user experience with drag and drop functionality, and dynamic connections to help guide exploration. Updates blend ease-of-use and efficiency with powerful analytics capabilities. 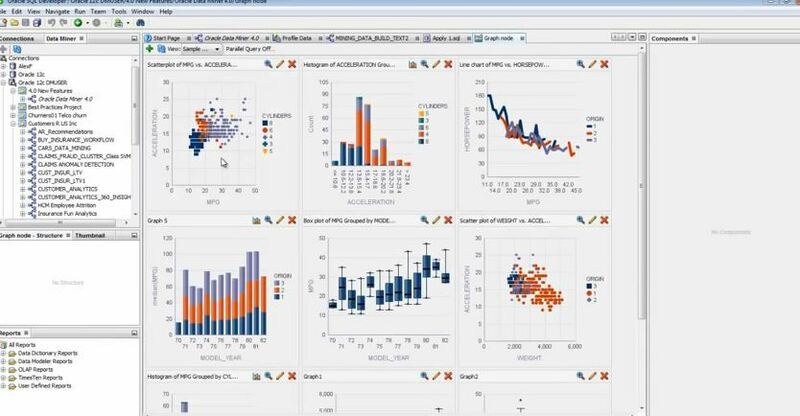 Oracle BI boasts sophisticated data integration and modeling capabilities, as well as new self-service capabilities for loading and blending data with no modeling required. Browse to personal text files and spreadsheets, then preview and upload them. Blend personal data with managed data and combine data sets, extending dimensions for timely analysis. The Oracle BI mobile app is available for Apple and Android. "One downside would be that it is kind of costly." Oracle is a great solution. It was very easy to learn how to use the product and to train our employees on the product. We use all available features. It has been great and very efficient. I like that it is easy to learn. One downside would be that it is kind of costly. "Product support and ease of use for the end user without any doubts in my mind. Oracle does everything my company and employees need to have in place. Without the programing they provide my company would not be in business. This company helped my company be sucessful." Oracle is a terrific company and they supply the support I need in my company when I need it not later. They also provide many platforms to work from. Another thing is how user friendly the system is. It is a really fast thing to help teach new employees how to operate. It is cost efficient and time saving. I have worked with oracle for years. Even tried a few others out. By far this is the best company to work with if an owner like myself needs to get things done. Great company, great people who run it. What else can I say. Great, great, great!!! Database replay,partitioning,edition based redefinition, transaction management, pl/sgl efficient coding, security, managability, sql pivot and non pivot, security files, backup and recovery, automatic storage management. Those are some right off the top of my head, but my company uses other tools from them as well. I just cant recall at the moment. Been a long day and not much sleep. How does this perform? Oracle is outstanding. I mentioned it before. The benefits of having it are too numerous to express. Without it I could not run my business. They took difficult tasks and made them 100 times easier in my company. I haved saved several million in training cost alone. Another thing is I dont have to keep switching up platforms, Oracle is always up to date and on top of everything every hour of every day. It is a great company. Product support and ease of use for the end user without any doubts in my mind. Oracle does everything my company and employees need to have in place. Without the programing they provide my company would not be in business. This company helped my company be sucessful. I have no dislikes. If I had to say anything I guess it would be that the world changes all the time and it can be challenging to keep up in the technology world and to keep my company up to date. But they do a good enough job of that. "Overall it has performed well, we are still at the beginning stages of implementation where we are focused on creating dashboards. We hope to use the more advanced analytics tools in the future." We mainly use Oracle BIEE for analyzing enrollment data at our College. While I wasn't involved in selecting the solution, I am one of the main users of the system (in IT). We haven't had many problems, our biggest hurdle has been figuring how to analyze the data and provide effective dashboards to our users. We mainly use dashboard for data analysis. Overall it has performed well, we are still at the beginning stages of implementation where we are focused on creating dashboards. We hope to use the more advanced analytics tools in the future. We selected Oracle because we use Oracle SQL for our main ERP (Ellucian Banner) so we knew that would save time with the implementation. We really don't have any negatives at this time. "The best features are Database Vault, Data Mining, and PeopleSoft." Oracle is closed source, and when something goes wrong and you have a problem the answer is just a phone call away. It manages memory very efficiently and can handle complex JOIN operations . Oracle has a great Architecture, it makes it rock solid because it is very easy to organize different applications data very well. I think the best plus for me is the SQL Engine that Oracle possess, it is very advanced, making it the only database to operate a data warehouse! Running complex queries on Oracle is just easy. Other features like Materialized Views, PL/SQL e.t.c. make Oracle a great value for the money. The best features are Database Vault, Data Mining, and PeopleSoft. It has performed well other than a few glitches here and there, but nothing that couldn't be overcome quickly. The benefits are a streamlined HR process, simpler backup and recovery commands. Oracle can help you create customized database applications. Instead of getting a standardized database program out of the box, you get a program that can be customized to fit your needs. This makes it possible to create a database that only has the features you need. It also gives you the chance to eliminate any unnecessary features in the database application for your business. It uses open source industry standards to help you have features made specifically for your business. I would have to say cost is the biggest drawback. When you invest in this type of database management software, you will have to pay a fee for the use of the program. If you plan on using the program on multiple computers, you will need to buy licenses for each computer that you utilize it on. If you plan on making the software available on many computers, these costs can really add up. "Easy, great interface... and accessible and great usage for any individual.. also for those with basic computer knowledge." We need to keep track of all the employees movements. Also they need to be able to login by themselves and fill their timecards as well as do other actions and Oracle was the best option to manage everything automatically (before we used to do it manually and it was really time consuming). Automatic storage management, database, and admin interface are the key features we use. As said before, automating our whole data processing has become easier, faster and more manageable. Easy, great interface... and accessible and great usage for any individual.. also for those with basic computer knowledge. Actually nothing so far... we had some crashes but overall we are very satisfied and happy with the performances received so far. "The most useful features are query capability, data base structure analysis, data mining and analysis." We use Oracle SQL Navigator extensively for retrieval and analysis of data from several internal databases. The most useful features are query capability, data base structure analysis, data mining and analysis. It has performed flawlessly and provides me with results quickly. Ease of use and flexibility are amazing. I'd like to see them add more tools in order to facilitate query structure. "It is reliable, consistent, and easy to use." Oracle is used to collect data on student registration, enrollment numbers, attrition, grades, sustained education plans, and diversity of students attending. This system helps us to achieve these statistical goals. We would like more freedom with the system to create our own format to meet our ever changing data collection needs. I use the data input on student enrollment, grades, diversity, transfer, and attrition on the system Banner. We input data on various screens to meet our data needs and the benefits are we are able to address student needs, academically and personally, and we can track our students to identify academic trends. It is reliable, consistent, and easy to use. The format is not flexible and the screens can not be adapted. A more flexible screen option would be helpful to meet our data collection needs. "I spend way less time configuring my data and am able to export my reports to many different types of files." I love the different types of reports that I am able to create. Without these reports to pull, I would spend my entire work day just pulling and figuring up data. I also really love the different formats in which Oracle allows me to export the reports. Oracle has great reports. I spend way less time configuring my data and am able to export my reports to many different types of files. Generating data and compiling reports. Sometimes I'm not impressed with the way my reports export in Excel. It works, but I have to format it a lot. "We like Oracle because of the intensive training and they are always available to help. They are a great company because of their great trend analysis." We were looking for a set of techniques and tools to transform raw data into meaningful and useful information. Oracle provided the best service to help us with this transformation. We enrolled in some training courses first. Then we were able to take advantage of the software's customization to our needs. We use the analysis for forecasting which greatly improved our financial statements. We like Oracle because of the intensive training and they are always available to help. They are a great company because of their great trend analysis. Nothing at all to dislike. "Oracle has performed very well. It gives me a more accurate picture of day-to-day operations." Oracle allows pinpointing causes of high scrap and downtime. The features I use are dashboards, charts, tables, and filtering. Oracle has performed very well. It gives me a more accurate picture of day-to-day operations. The ability to data mine information relevant to analyzing daily operational trends is huge. The delay in current data can be slow.